Starting at the top, there is a nickel plated pear shape quick link attached to an "O" ring for easy hanging and a welded, nickel plated chain for added durability. 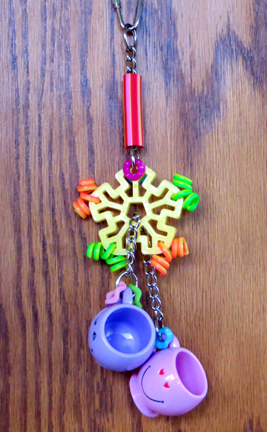 There is a fun, colorful foam tube covering the chain followed by another "O" right with "dangles" attached to a fun doily disk with squiggles. There are two colorful cups (about 1.5") with some ruffled rings for added interest, these cups are great for hiding your parrot's special treats and encouraging foraging. Sized for the mid sized beaks in your house. 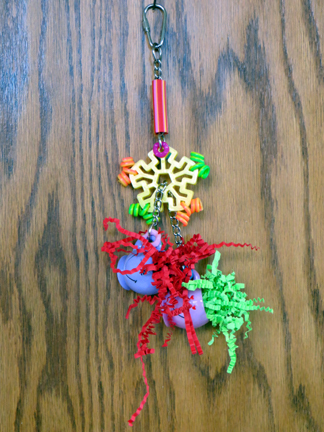 A sample of shredded crinkle paper comes with your Double Pleasure parrot toy!